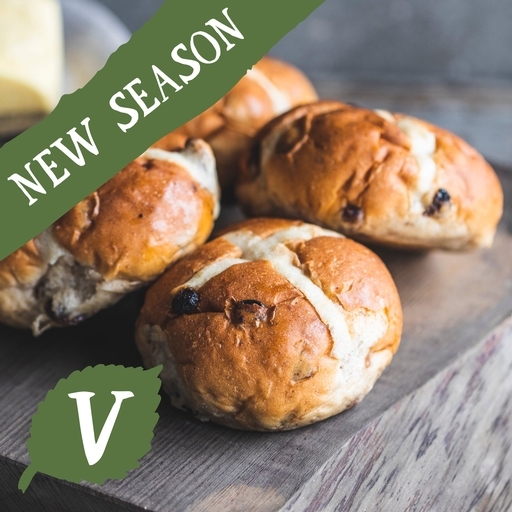 Soft, sweet hot cross buns with plump vine fruit, traditional fragrant spices and a sticky glaze. All that’s needed is a generous slick of butter. These round, golden buns are baked to our own recipe, and are everything we ever wanted a bun to be. After a day or two, they’ll be at their best toasted – all the readier to soak up the melting butter. Best eaten fresh. Keep them in an air tight container. After a day they will taste better toasted or warmed in the oven. Freeze on the day of delivery, once defrosted use within 2 days. These organic hot cross buns are baked for us by our friends at the Authentic Bread Company, using our recipe. The Authentic Bread Company was started in 1995 when Alan Davis, a former BT engineer of 26 years, decided to go professional with his passion for organic baking. Based deep in the Gloucestershire countryside, the business is still family-run, using time-honoured traditional methods and the very best organic ingredients to produce their wide range of award-winning baked goods. White Wheat Flour (Wheat, Calcium carbonate*, Iron*, Niacin*, Thiamin*), Sultanas, Water*, Honey, Sugar, Sunflower oil, Yeast*, Mixed Spice, Sea Salt*.